If you’ve never clambered aboard a camel imminently about to stride into the world’s largest scorching desert, there’s something you should know. Getting on is relatively simple. It requires only a good swing-kick of the leg to mount up. Holding on while the lofty beast maneuvers from sitting position to standing is another story entirely. First, you’ll get settled into the soft layered padding strapped to its back, feet dangling comfortably; the words ‘no problemo’ may occur to you. 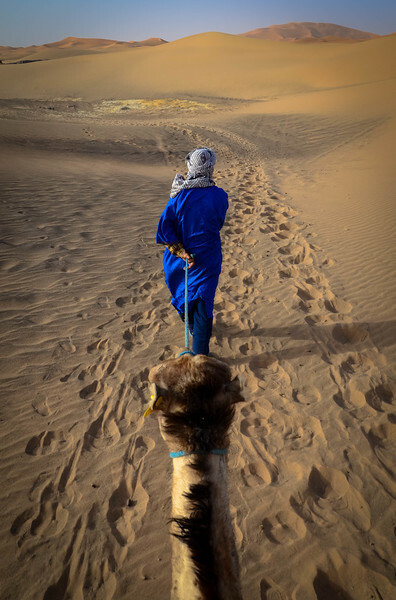 Then, your Berber guide will bark a sharp order in Arabic, tap a furry shoulder with his foot, and suddenly you’ll find yourself pitching forward while the dromedary shuffles to get its stilt-like hind legs underneath it. Next, you’re bucked backwards with a lurch, as if riding a lethargic bull at a rodeo for retirees. The front legs scramble to straighten and, finally, it hauls its chassis up to full towering height, accompanied by a decidedly unenthusiastic, reverberating groan. Then you’re ready to ride! 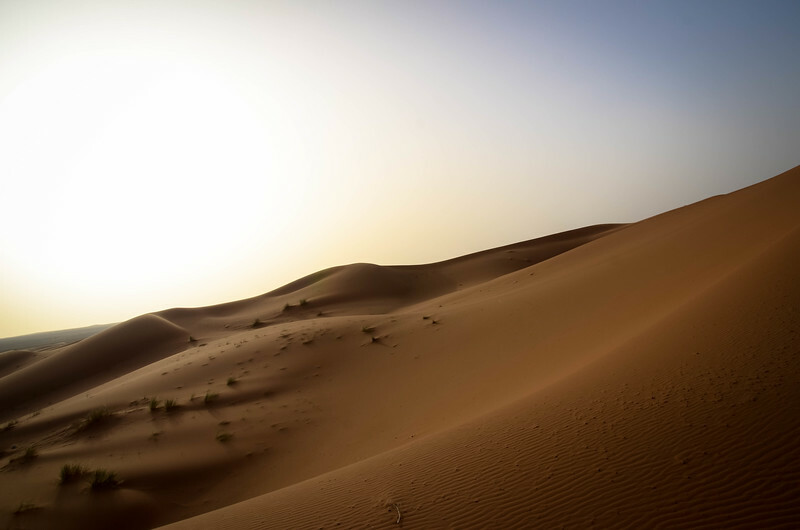 You head off into the massive iconic Saharan dunes toward an awaiting Berber camp at a reluctant, lumbering pace while your guide in front pulls insistently at the lead rope. Nevertheless, you feel like you can see the whole of the breathtaking desert from here, and you’re totally ok with the epic Lawrence of Arabia theme music that has involuntarily begun playing in your head. There’s a sand-shielding turban on your head, a smile on your face, desert sun on your back, and your cup runneth over with the kind of elation that occurs only when you are about to check off a major top-of-the-pile bucket list item. But first, you have to get yourself to the Sahara Desert. And that is an adventure in and of itself. I must admit, I wasn’t huge a fan of Ahmed from the get go. My travel companions, Maria and Colin and I met our driver for the two-day journey to Merzouga (where the camel trek would begin) on the last morning of our stay at our lovely riad in Marrakech. He was a Berber friend of our trusted riad contact, Kamal. Kamal said Akmed was a good man, and Kamal had been straight with us about everything else so far, so we looked forward to meeting Mr. Ahmed. What I in fact met was a brusque, overly direct, slick-haired, Selleck-mustachioed man with a less-than-stellar English vocabulary, who, if he were a Hollywood actor, would undoubtedly get type cast as the hitman, psycho, or drug dealer. Ahmed (which he pronounced with plenty of throat-clearing “hhuch”) didn’t say much to us as he loaded our bags into his aging black minivan. We all got in and Ahmed began navigating his way out of the medina through morning throngs of Marrakechans, while blasting some of the most abhorrent rap music ever to assault my ears. In any case, this was not the beginning of a beautiful friendship. 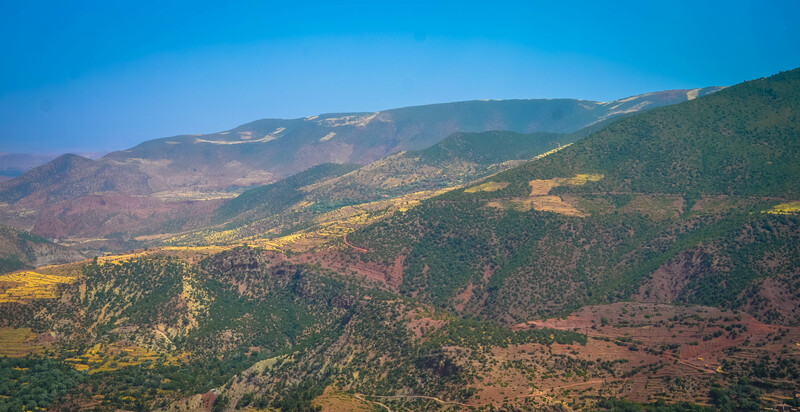 As we headed southwest through the High Altas Mountains, the first thing I realized about our driver (aside from his poor taste in music and our communication problems) was that he didn’t just drive—he flew. 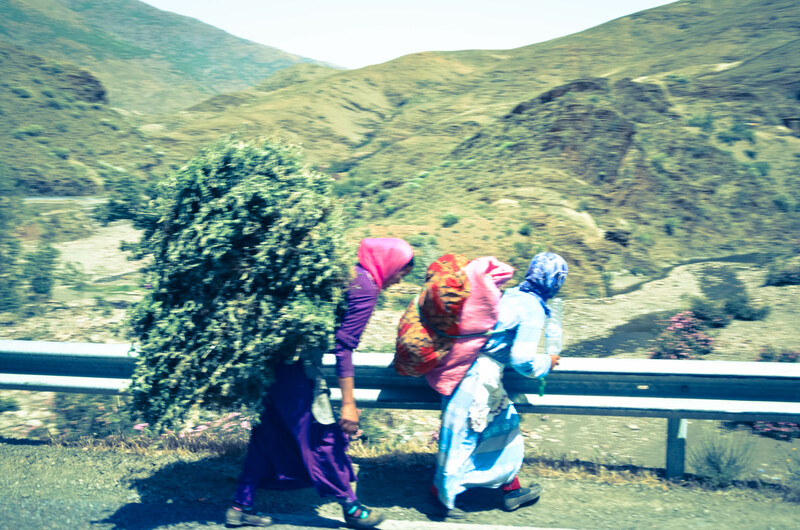 Ahmed put pedal to metal on all of the precarious mountainous straightaways, barely tapping the squeaky brakes before careening around hairpin curves while we drifted into in the center of the road, occasionally having to swerve out of the path of oncoming traffic, locals or donkeys. He also was in the habit of texting on his phone and changing the music, which didn’t help me feel more secure. Eventually, I forbade myself from glancing through the front window because each time I did, I was 100% certain we were going to die. The second thing I noticed about Ahmed was that he seemed to be under the impression that we desired to get out of the car to look at every. single. halfway decent view along the way. The frequent view stops did appear to correlate with his frequent compulsion for a cigarette break, or the shop hours of roadside ‘stuff hawkers’ (rugs, rocks, pottery, knick knacks, and more heavy, and often mass-produced tokens that we’d seen a hundred times before and continued to not want). The third thing I noticed was that Ahmed did not appear to adhere to any sort of ‘no drinking while driving tourists on mountains’ rule. We stopped at the bar/backyard of one of his many buddies to have a beer. Technically, Colin and I each had a beer, and Maria passed on hers, so Ahmed drank both his own plus hers. An hour later we stopped at another bar and Ahmed treated himself to yet another beer—all the better to navigate narrow mountain roads, I say! At one point we pulled over to rescue a friendly Indian family of four on vacation, whose rented car had given out, their cellphones unable to get reception so high up. Just when I was starting to soften and give Ahmed a little credit for the kindness he showed these people who needed a lift to a nearby cafe, he revved the engine and roared through the hills like an out of control steam engine, apparently trying to make up the three minutes he’d lost trying to help. 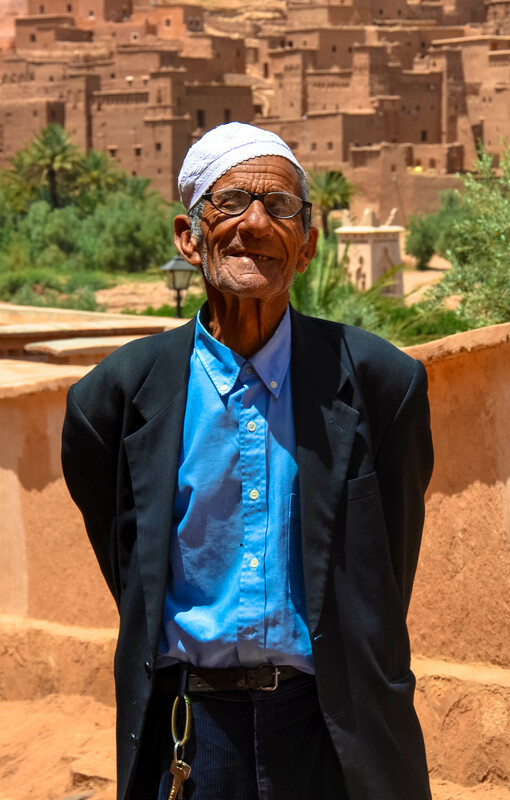 Ahmed hooked us up with his friend Mouad to be our guide for the Aït Benhaddou kasbah tour. The old man enthusiastically jumped up and down several times upon meeting us, smiling proudly with his five-tooth grin and shaking each of our hands vigorously in greeting. Though Mouad professed to speak six languages, we couldn’t identify many of his words as English. 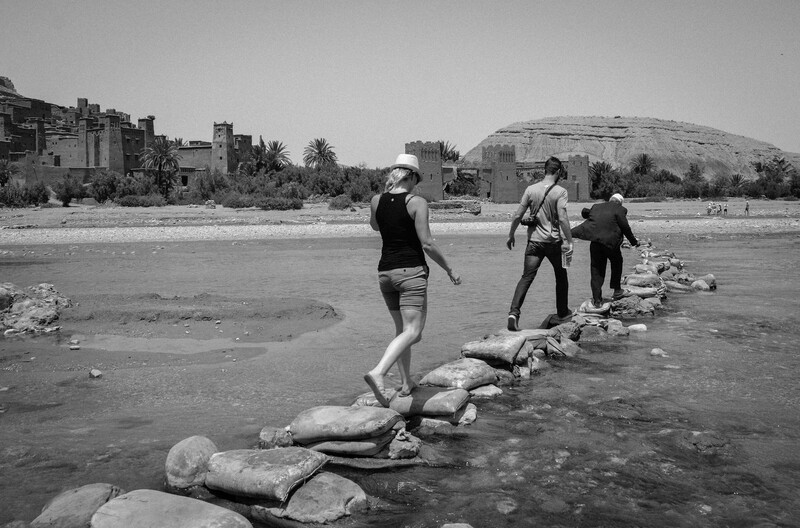 But we instantly liked him anyway, and followed him as he skittered spryly across the piles of sandbags that served as a bridge for crossing a stream toward the kasbah. We noticed the locals were using the clear, crystalline stream for washing their dishes and laundry. 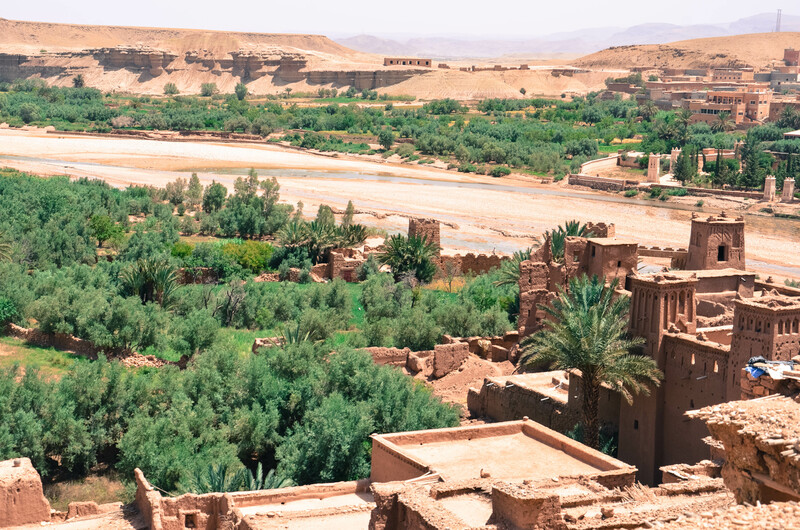 Aït Benhaddou, a UNESCO World Heritage Site, is a 1,000+ year old fortified city strategically perched on a hilltop that offers impressive views of the Rif Valley for miles and miles. 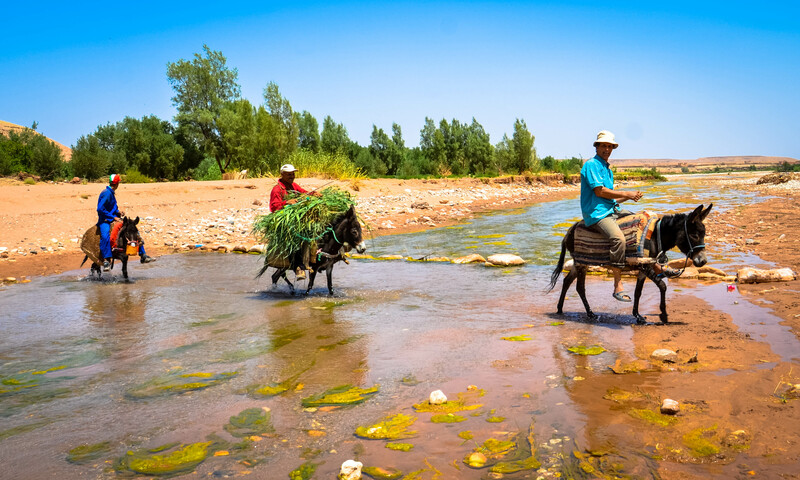 Sturdily built from the area’s plentiful red clay, mixed with straw, the walls of the kasbah form winding ant farm-like paths that sprout sudden houses and side rooms, donkey corrals, chicken coops and gateways. Calf-burning stairs spiral gradually upward through the city to the top of the hill where a building still stands that once protected the king’s treasury of gold and silver. We found out that the site has been used for a line list of TV shows and films, including Gladiator, The Mummy, Babel, and Game of Thrones. Yes. We are rockin’ the kasbah. Later, we pulled into the dusty, minuscule town of Ouzazate where Ahmed knew of a nice riad we would stay at for the night. It had a swimming pool (insert our dry-throated gasps of utter joy here), which we had a grand time utilizing that evening as the harsh desert heat began to release its grip. As the day had progressed, we’d all noticed that Ahmed was clearly developing a bit of a crush on Maria. A few small things had tipped us off, but mostly it was his intense focus on the state of her happiness (was she comfortable? Cool enough? Warm enough? Was she hungry? Thirsty? In need of candy? He had candy she could eat!). And his admiration became even more evident as he parked himself with his dark sunglasses and beer on the opposite side of the pool from where she sat sunning and reading. Behind the sunglasses it couldn’t be proved that he was leering creepily… but it also couldn’t be disproved. The next day was camel trek day! I woke up excited, despite knowing that we still had a good half day’s drive ahead of us before reaching the Sahara border town of Merzouga. Maria and I declared that we’d more or less had it with Ahmed’s constant stopping (we’d lost track of all the places he’d had us stop the day before), we just wanted to get to the Sahara: point A to point B. That’s it. Nothing more. And we explained this to Ahmed when he picked us up. 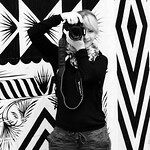 Maria and I glanced at each other and sighed. The “rose garden” turned out to be a bunch of scraggly bushes on the side of the road. The area was easily passable at 70 MPH without so much as a pause to differentiate the roses from the copious amounts of similar flowering bushes coexisting everywhere. Stubbornly, us girls stayed in the van, snoozing while Ahmed and Colin got out to walk around. We opened our eyes as Ahmed returned with his open palms cupping a small heap of picked rosebuds, which he offered to Maria. I got a couple, too—one must also appease the lady’s friend, after all. We were about to continue on when two young men approached the car holding heart-shaped wreathes fashioned from the roses, strung onto a bent hangar wire. I expressed mild pity at having to shoo them away without a purchase. But Maria exclaimed, “Pretty!” And with that, Amed stepped on the break, threw the car into park, and fished some change from his pocket to buy one—wait, no, two (good catch, Ahmed)—of the rosy wreathes, which he then presented to us grandly. 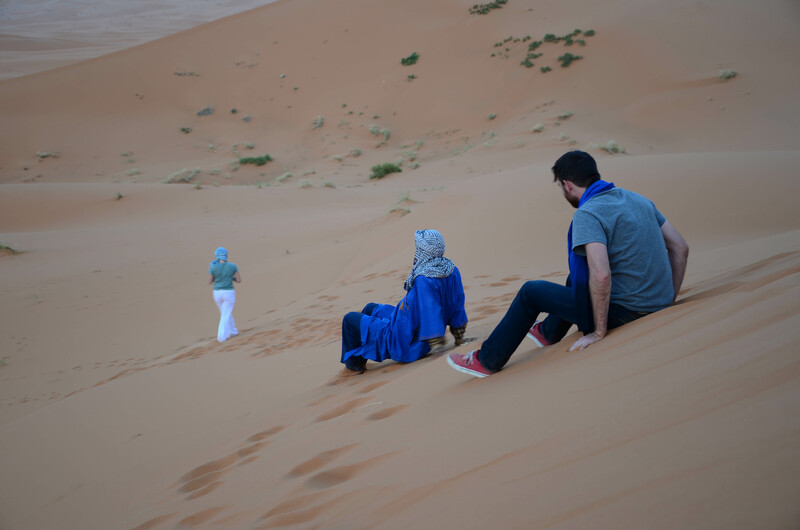 Our ‘no more unnecessary stops’ drive to Merzouga included several more stops. In all honesty, most of the places Ahmed took us were pretty cool, and if we hadn’t been so utterly tired of being in the hot car for so long (Maria was especially over it, as she had been dealing with ongoing carsickness), we probably would have enjoyed them a bit more. 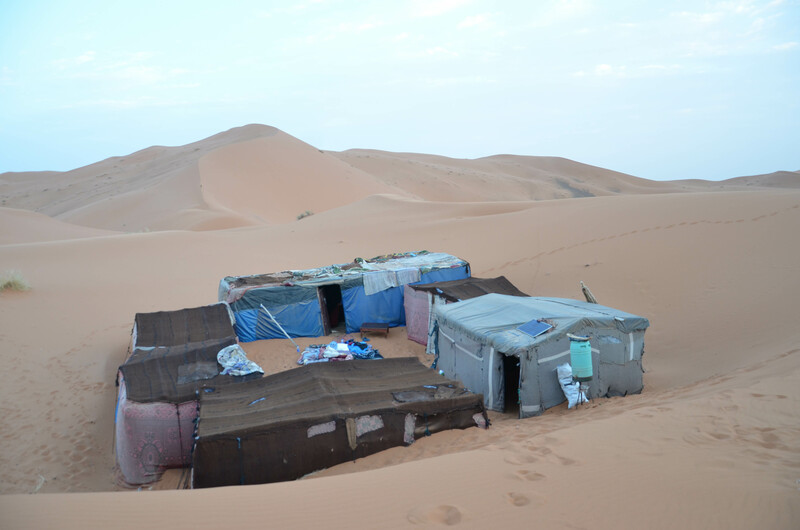 At last, after a very long day on the road, we arrived in speck-on-the-map Merzouga. The driveway (if it could be called that) to the camel ranch was little more than a fairly-well-tread path that criss-crossed with other paths to who-knows-where, etched into the flat, packed earth bordering the big dunes. We were not in the most optimal of moods as we trudged into a large warehouse-type building to sit on cushions in a corner to wait for things to begin. We were served syrupy-sweet hot mint tea—a welcoming gesture that had begun to wear out its welcome as we continued to politely drink glass after glass of the stuff offered to us several times per day, every day, in the kind of heat that ordinarily would smother the idea of warm beverages under a pile of thousands of other things you would rather be drinking. We were all exhausted; I had a headache, Maria was just toast, and Colin was coping the best he could with us. 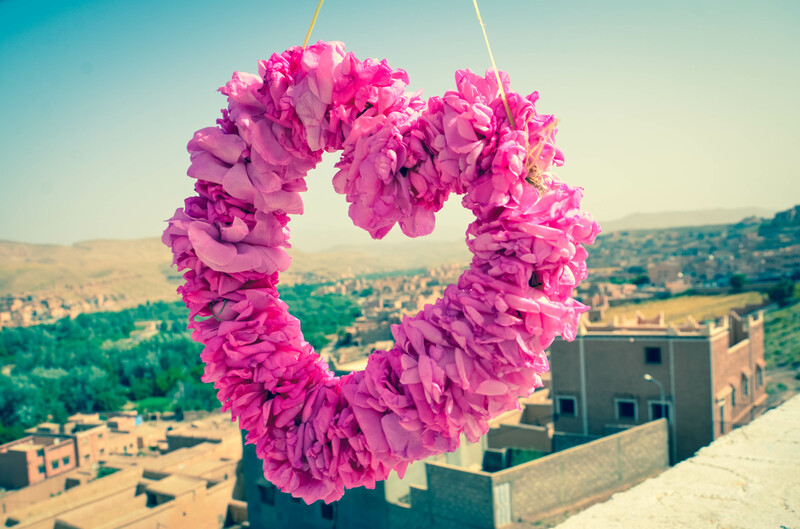 I despaired that this was the condition we’d be in when it came time for the one big thing that I had wanted to do in Morocco all along. The only thing we could do was recline on the dirty cushions, pop some aspirin, chug some water, and pray that an hour-long cat nap could rejuvenate us. When I woke, the headache had thankfully dissipated. Maria was feeling better, too. With renewed energy, we readied our overnight bags for the trek. 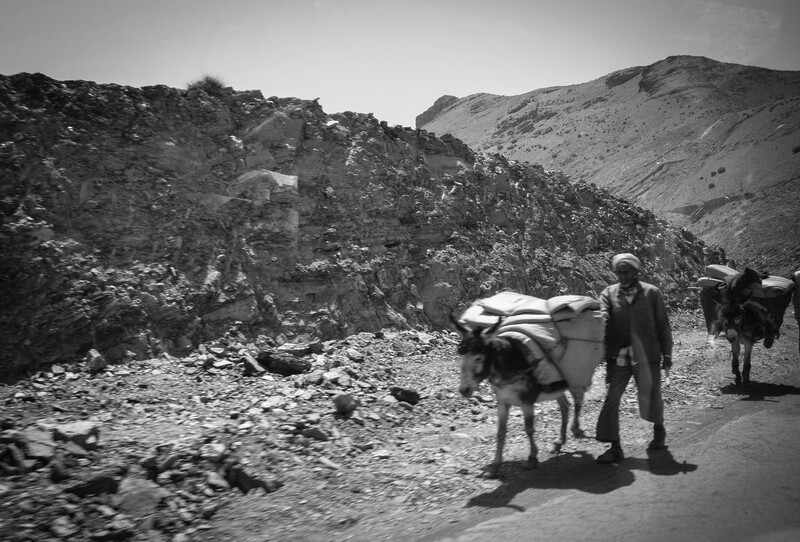 We met our guide, Muhammad, soft-spoken Berber with tough weathered skin and smile crinkles at the corners of his kind brown eyes. One look at our baseball caps and Panama hat (pathetic sun-protection) and the guys demanded our scarves (they gave Colin one to use), which they quickly and deftly fashioned into protective turbans for each of us. Feeling slightly badass, and like “real” camel-riding folk, we were then marched off to meet our rides. Ahmed bid us good luck and told us to have fun. Strangely, in the excitement, everything felt forgiven, and we happily waved goodbye to our Selleck-‘stached driver. Our three camels were saddled up and sitting placidly in a nose-to-tail line as we approached. The first camel was assigned to me. 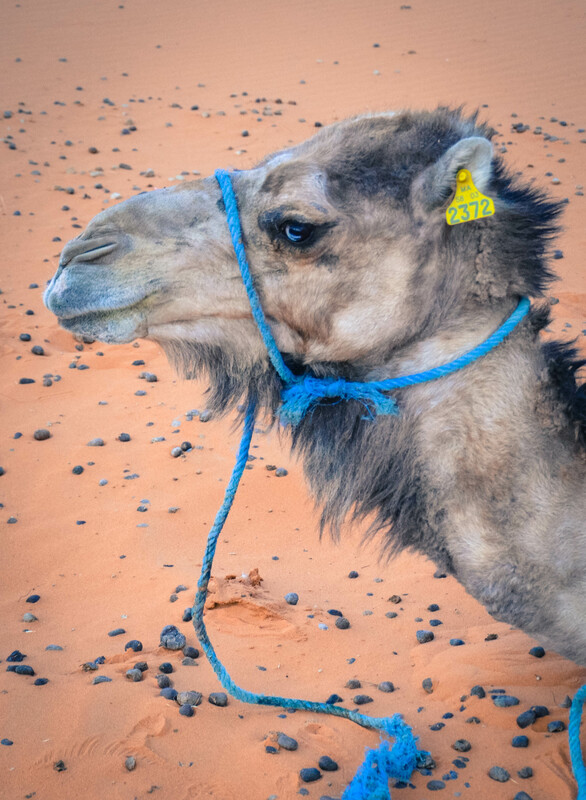 I was struck by his shocking aqua colored eyes—I never considered that camels might have blue eyes—rimmed by a fringe of deep black sand-deflecting lashes. With the appealing shading of a frothy cappuccino, he was lighter in color than the others, and, I thought, the prettiest. 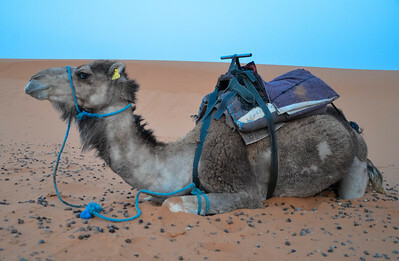 He seemed well behaved, the sort of camel worker that likes to get to the office, the job done and not cause a fuss. I knew we were going to get along brilliantly. 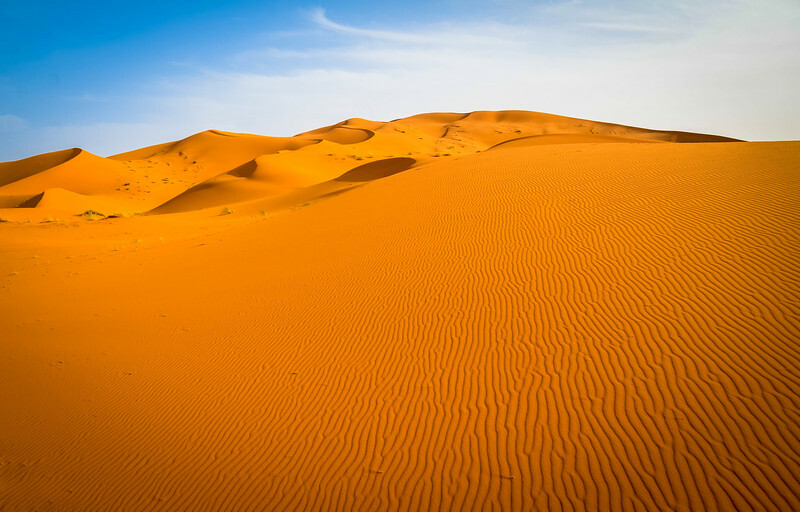 Dunes like mountains of reddish-orange-hued sugar materialized as Muhammad led us deeper into the desert. The plodding walk of our camels became a soft-thumping beat set to a tune of whispering breezes. 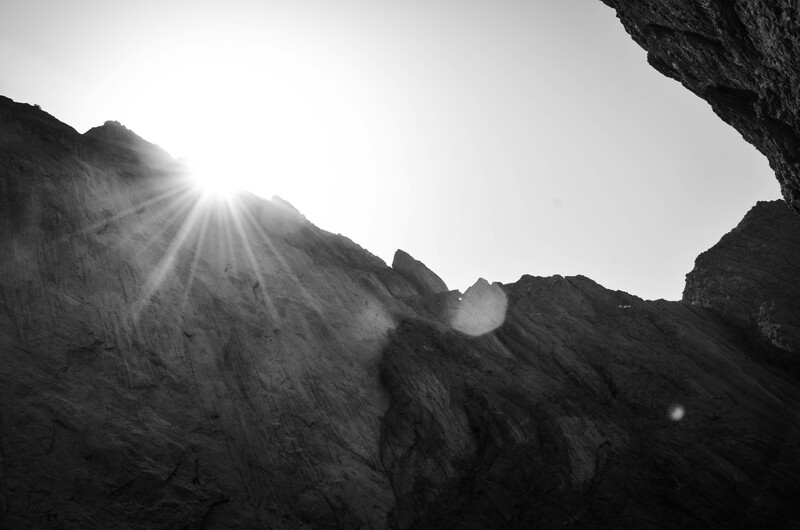 Those same breezes stirred up light veils of sand, lifting them gracefully over the peaks that we followed. The heat of the day was giving way to the perfect evening temperatures, which let us focus on the stunning beauty around us and the swaying walk of the beasts below us, as the sun dipped low. A serene quiet filled my ears. Gone was the noise of the road, of the cars, of the people. Out here, the only sound was the warm wind. I felt tension evaporate swiftly from my muscles, and float away into the ether. After an hour or so, Muhammad halted us and commanded the camels to sit and let us off. With a twinkle in his eye, he informed us that we’d get some great views of the sunset at the top of a huge dune nearby. Then he was off and climbing the behemoth. Shrieking and laughing, we followed, slipping, sliding and scrambling up, and soon were skiing down the dunes on our feet and butts. Our pockets, shoes, turbans and ears filled with sand, but we didn’t care. 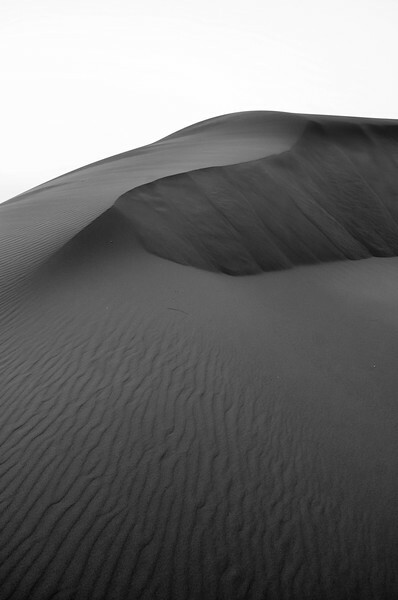 The sand felt smooth and silky, as if spun from the purest elements in the universe. 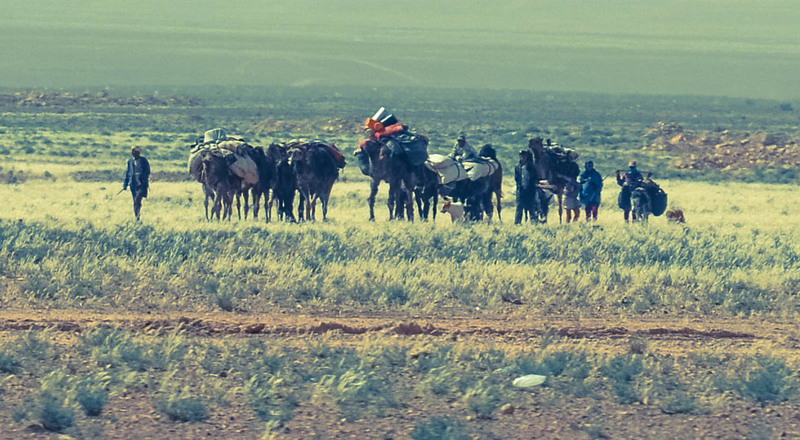 Smiling and still giggling and joking, we re-boarded our camels and continued onto the Berber camp, which sat like a fortress of rugs in a dip between several sandy hills. Another command in Arabic from Mohammed instructed the camels to bow and let us off once more. He hobbled them to ensure they’d still be there the next morning, then he motioned for us to follow him to the camp. The camp was a simple complex constructed of poles, vast rugs, some wood, and tent canvas encircling a common square, lit by a single bulb and wire propped up with a long stick wedged into the sand. Mohammed unrolled a large flat mat into the middle area, and dragged out three mattresses from one of the rooms, as well as a small table for us to sit at. 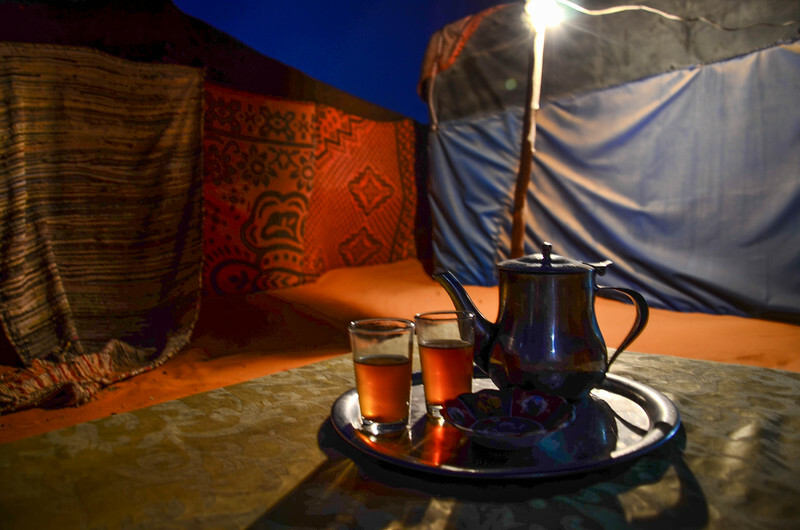 He disappeared into the kitchen tent and reappeared a moment later with bread, jam, honey, butter, olives, and (yet more) mint tea. This time, however, we sipped it happily, as if we hadn’t been drinking it each day for a week and a half straight. 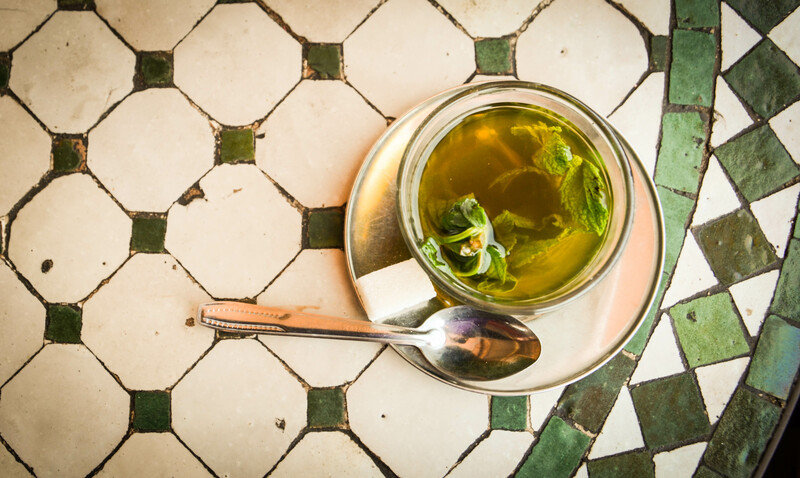 Somehow this tea was more delicious and more satisfying than any other we’d sampled. Then Mohammed went back into ‘kitchen’ and stayed there for an hour or so, softly clanging pots while we lounged on our mats, chatting and enjoying the peacefulness. The sky had deepened into black, pin-pricked with emerging stars by the time dinner was served. Mohammed had prepared chicken tagine accompanied by steamy fruits and vegetables: potatoes, carrots, eggplant, figs and grapes. It was delicious Moroccan food made even better by the surroundings and company. 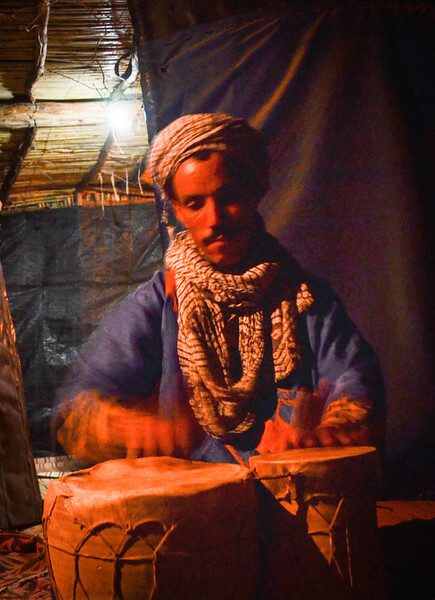 After dinner, Mohammed retrieved his wooden bongo-type drums and played for us, and taught us (or rather, attempted to teach us) a few traditional Berber beats. We took turns doing our best, and had fun laughing at each other’s ridiculous efforts. After a while, satiated and sleepy, it was time to turn in. We each curled up on our mattress and pulled our blankets around us. 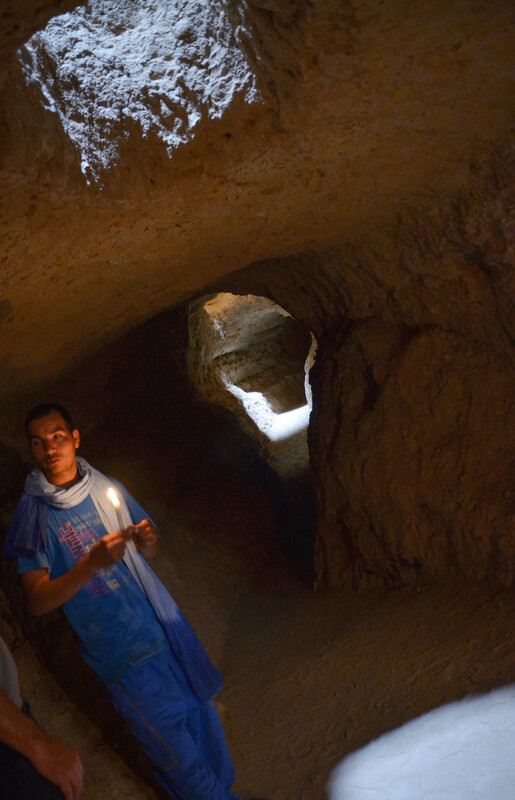 When we were ready, Mohammed turned off the bare lightbulb. As soon as the electricity flicked off, the lights of the galaxy blazed on. We gasped at the sight. I have never witnessed a night so richly black, or stars so innumerable. 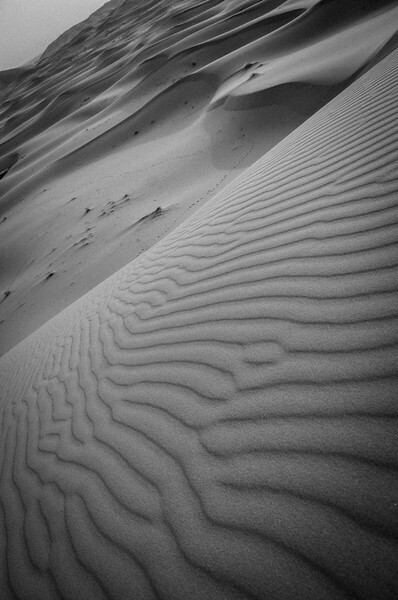 The starlight filtering down seemed to illuminate each grain of sand of the dunes surrounding us subtly, almost as if each grain itself were faintly glowing on its own. I drifted to sleep with my friends next to me, a soft, warm breeze flowing over me, and a feeling of deep tranquility in my mind. The next morning, I was awakened by Mohammed. “Good morning, it’s time to wake up,” he said in his quiet way. I sat up, looked around and saw that Colin and Maria’s mattresses were empty. 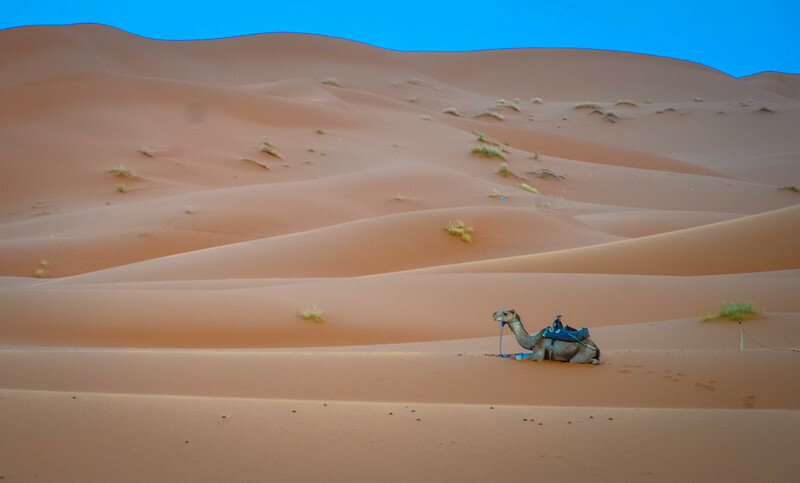 Mohammed pointed toward the dunes and smiled. I stood, grabbed my camera, and trudged groggily up a sandy hill. In the distance, I could see Maria sitting cross-legged on, looking peaceful as the morning sunlight grew brighter from behind the massive dunes on the horizon. No sign of Colin. I decided to climb the closest big dune and try to catch the sunrise with my lens. Glances backwards told me I wasn’t going to make it, so I stopped and snapped several just as the sun was peeking. Then I stopped absolutely everything. I lowered my camera, knelt and sat on the sand and simply watched as the sun rose smoothly and steadily. It was breathtaking. I looked back at the dune I’d been climbing and saw Colin at the top. He waved and I continued to scale it, huffing and puffing to the top. We sat silently taking in the scene, snapping shots of the incredible views every so often. Finally, as the sun was beginning to warm, it was time to pack up and head back. 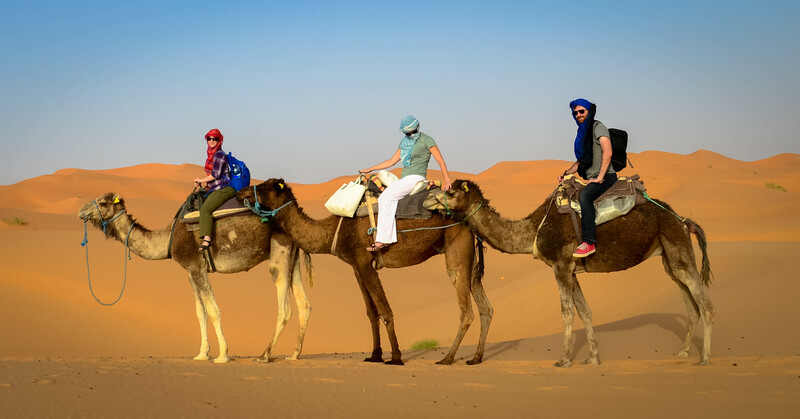 By now the three of us were seasoned pros at getting on and off of camels. Back at the camel ranch, I said goodbye to my wonderful Sandstorm and Mohammed. Ahmed met us with a big smile, and helped us load up the van for one last short distance as our driver. 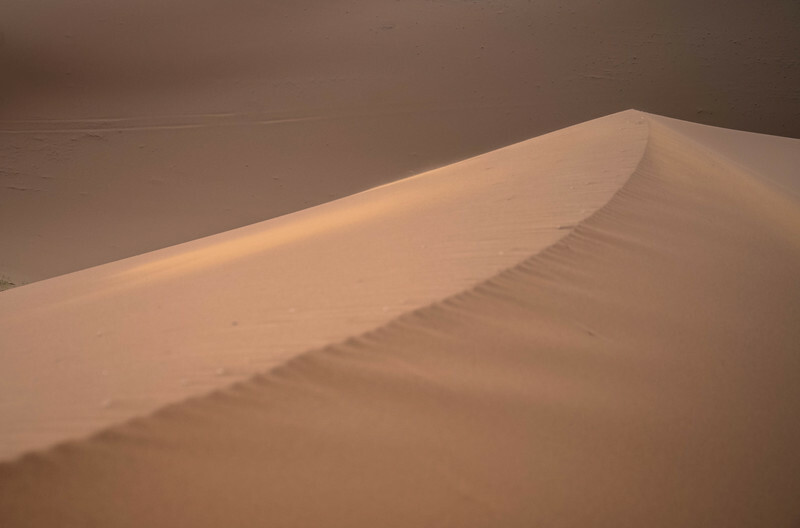 Maybe it was residual relaxation from our night in the desert; maybe I had started to forget about all the times I had almost died at his hands; or maybe I had just decided that he wasn’t so bad in the end. Whatever it was—Ahmed was suddenly alright in my book. 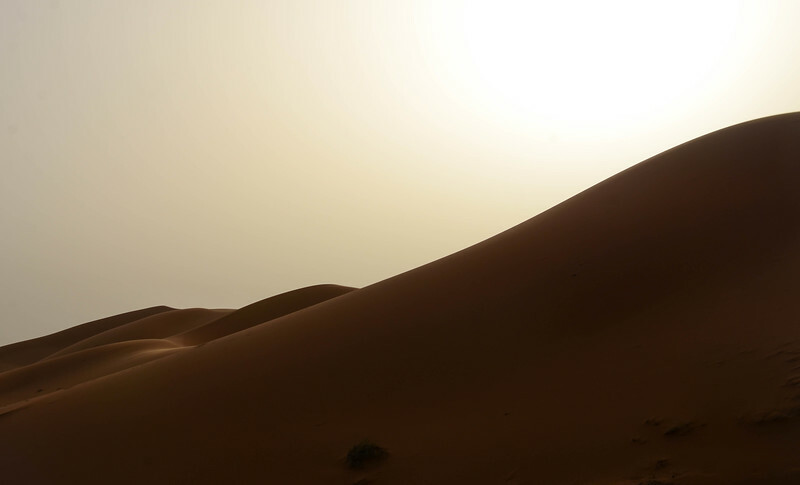 It was he, after all, who delivered us safely to the most torrid, harsh, and beautiful desert on Earth for one of the most remarkable experiences of my life. And for that, I can only be grateful. Next stop: Cairo, Egypt and the Great Pyramids! 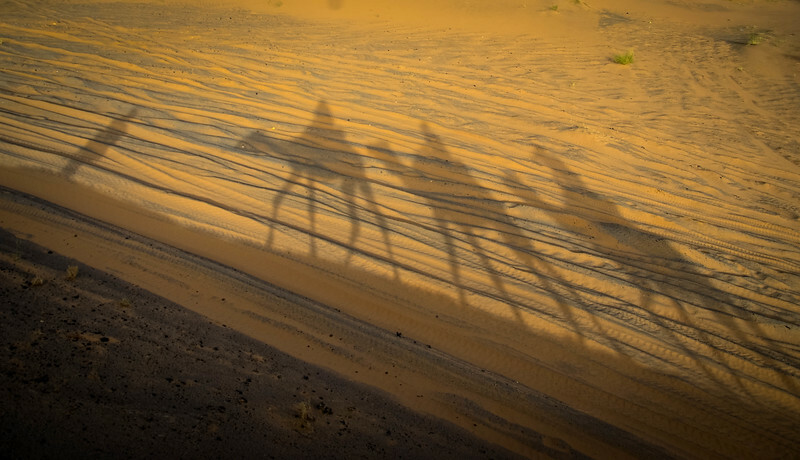 Your shots in the desert are spectacular, K. Especially love the one from your POV riding the camel. Thanks for posting. WW, that was the best posting yet! What a great adventure. I am so glad you shared it with Colin and Maria. Can’t wait to hear more stories.